Enjoy a truly classy cruise on board the Panorama II, the ideal place to embrace the very best of cruising in superb comfort and style. You are sure to experience unforgettable moments on board the Panorama II. In the cabins of the SC Panorama II you will find a perfect combination of luxury and comfort, allowing you to feel like royalty while retaining the familiarity of your own home. The cabins are complete with modern features but have pleasant wooden furnishings and an interior with a nautical feel. 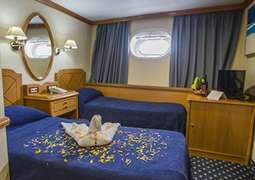 You can rest assured that all the cabins on board are complete with all the modern comforts such as air-conditioning, mini-fridge, TV and for a touch of luxury, a bathroom finished in marble. The bar and the restaurant on board the SC Panorama provide the most delectable meals coupled with the highest level of service. Here you can enjoy local cuisine or request a custom dish to be prepared at the buffet, all served in a spacious and welcoming atmosphere. The restaurant on board provides for all tastes, with it being possible to have a vegetarian or specialist option prepared if you make a request in advance. On the main deck there is a lounge, which is perfect for you to relax in, with comfortable sofas in a room with beautiful furnishings. In addition to this you can watch satellite television in the lounge. There is also an opportunity to enjoy the open sea air on the sun deck where you can either sit out and enjoy the rays or in the shade and while away the journey with a pleasant view of the passing scenery while either getting a tan or simply reading a book. The scenic locations that you cruise to are best explored using the water sports equipment like kayaks and snorkeling gear, which is available on request. There is the chance to sail and optional excursions to get to know the locations even better. The ship also has a swimming platform, which gives you direct access to the sea. An elegant ship needs an equally as elegant dress code, however during the day you can dress in smart casual but in the evenings it is advisable to wear more formal attire.